The gluten, wheat and milk free white farmhouse loaf from Warburtons Gluten Free is deliciously soft and full of flavour. 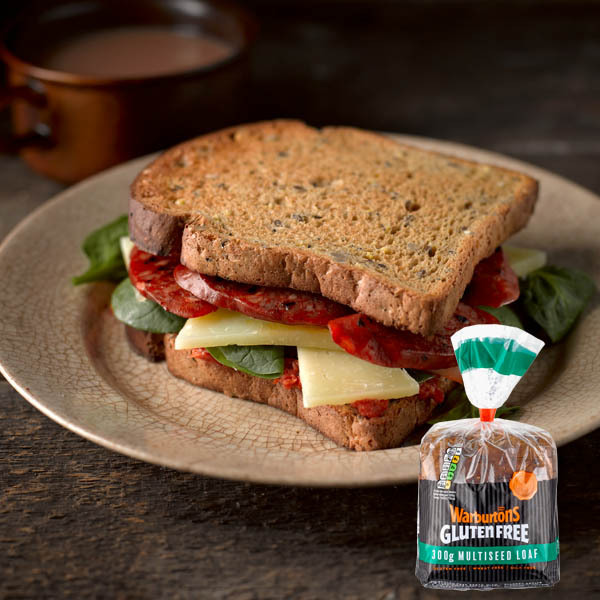 Our gluten free white bread provides a source of fibre and iron, is low in saturated fats, a source of fibre, a source of protein and low in sugar. What's more, two slices of our bread provides half your daily calcium needs. Water, Tapioca Starch, Potato Starch, Maize Starch, Rapeseed Oil, Yeast, Egg White Powder, Stabiliser: E464; Sugar, Vegetable Fibre (Psyllium), Fruit Extract (Carob and Apple), Calcium Carbonate, Salt, Humectant: Vegetable Glycerine; Rice Flour, Preservative: Calcium Propionate; Natural Flavouring, Iron. Our expert bakers have created our Multiseed Loaf, as enjoyable as always but in a smaller, more convenient size. 'Hedgerow’ for two reasons – firstly for its brambly mix of blackberries and rosehip, and secondly because this is perfect picnic fodder!